Each and every time Kyle Palmieri meets with a military member, he takes away something meaningful from the conversation. On the evening of February 23, he’ll have plenty more of those moments. In just over week, the 28-year-old Palmieri, in his ninth NHL season, will host the inaugural Kyle Palmieri Foundation Military Ball. The event will raise money to support three military nonprofits: Service Women’s Action Network, National Military Family Association and Pets for Vets. 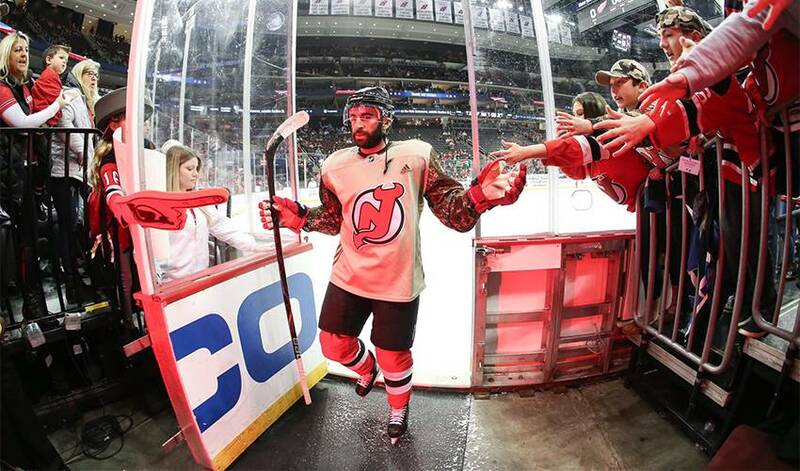 For the New Jersey Devils forward, giving back to the military is deeply personal. His sister, Taylor, currently serves in the New York National Guard, and his brother-in-law, Stephen Ficchi, is a U.S. Army Ranger. “It all started as a program where I was bringing veterans and their families to games, and getting some time to spend with these men and women who have served our country,” recalled Palmieri of the military recognition program called Squad21 he established in 2016, which still lives on through his foundation. Giving back is what the New York-born, New Jersey-raised forward did during this year’s All-Star Weekend. The NHLPA and United Hockey League (UHL) All-Star Hero campaign, through the NHLPA Goals & Dreams fund, recognized military personnel and their families by sending four service members (and a guest) to San Jose for the All-Star Game and All-Star festivities. It also provided the chance for the military members to meet and interact with players in the NHLPA All-Star Lounge. Palmieri met with some of the special guests, including Sgt. Richard Silva, a United States Marine Corps veteran and recipient of a Purple Heart and Bronze Star with Valor, who was medically retired in 2008. It was an emotional moment for both men. Sgt. Michael Brewer, MCpl. Stephen Giza, and Lt. Col. Darrin Janisch were also on hand as the other three 2018-19 #YourAllStarHero winners. Soon, Palmieri will enjoy similar experiences through the Military Ball that takes place at Nanina’s in the Park. VIP Tickets enable guests to have a one hour mix and mingle with Devils players prior to the General Admission doors opening at 7 p.m. ET. He’s eager to say thank you to those he has such high regard for. Click here to purchase your ticket and join Kyle and many others raise money for three very worth causes.